Main sequence stars such as the Sun wind up as red giants. Studying red giant stars tells astronomers about the future of the Sun (in a few billion years). It also tells us about how previous generations of stars spread the elements needed for life across the Universe. One of the most famous red giants in the sky is called Mira A, part of the binary system Mira about 400 light-years from Earth. Mira A is an old star, already spewing out the products of its life’s work into space for recycling. Mira B, Mira A’s companion, orbits A at twice the distance from the Sun to Neptune. 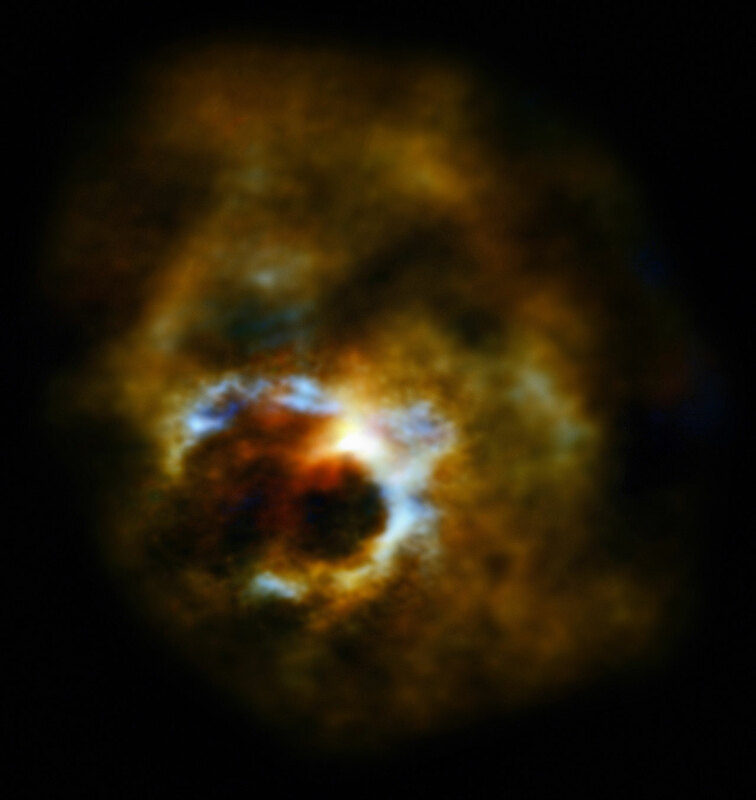 Mira A is known to have a slow stellar wind which gently moulds the surrounding material. Mira B is a hot, dense white dwarf with a fierce and fast stellar wind. Recent observations at millimeter wavelengths show how the interaction of the stellar winds from the two stars have created a complex nebula. The bubble at the centre is created by Mira B’s energetic wind inside Mira A’s more relaxed outflow. The heart-shaped bubble, formed some time in the last 400 years or so, is a relatively young object in astronomical terms.